Home » Charles the first in the guard room. 17th century. By the 6th of January the “High Court of Justice,” the self constituted commission of a self-elected parliament, had been appointed. There were 135 members, and on the 8th of January fifty-three of these had assembled in the Painted Chamber, headed by the Lord General Fairfax, who never appeared among them after that day. No more than eighty of the commissioners ever met at one time. Bradshaw was appointed president; Mr. Steel, attorney-general; Mr. Coke, solicitor-general. At the first day of the trial only sixty answered to their names, which were called after the king had been brought in. On the 9th a herald proclaimed that the people should bring in what matter of fact they had against Charles Stuart. The place of trial was the upper end of Westminster Hall, which was divided by strong barriers from the lower half, the Gothic portal being opened to the immense crowds of people. Everywhere within and without the building were soldiers under arms. The bar was an inclosed space within the barrier. On the 19th the king, who was now a prisoner in the custody of guards, was brought from Windsor; and on the following day he was brought in a sedan chair to take his trial. A chair covered with velvet was provided for him to sit upon. As he entered he looked sternly upon the court and upon the people in the galleries, and sat down without moving his hat. His severe glances were returned by his judges, who also remained covered. One can almost imagine the awful stillness of that scene broken by the buzz of the attendants or the whispers of the people. The vast building with its lofty, dark oaken roof; the gray cold January day, the commissioners seated with grim and solemn countenances, the galleries at the sides filled with spectators, among them the Presbyterian wife of the lord-general,—Lady Fairfax,—who is bitterly opposed to the whole proceeding, and remains loyal to the king. Bradshaw rises stern and hard to inform the prisoner of the cause of his being brought thither. Coke, as solicitor to the Commonwealth, succeeds him, but as soon as he begins to speak Charles holds up a gold headed cane, and touches him two or three times on the shoulder with it, crying, “Hold! hold!” The head of the cane drops off, and Bradshaw tells Coke to proceed with the charge against Charles Stuart, king of England, in the name of all the commons of England, for treason and high misdemeanors. When the clerk, to whom it is delivered, begins to read the charge, Charles again cries,”Hold!” but the reading is not stopped, nor are the faces of the president and the court moved by the interruption. The prisoner sits down looking on the ground, but presently looks some times on the High Court, sometimes up to the galleries, and then rises again and turns to scan the guards and the people in the hall, but still with the same stern face, till, when he has sat down once more, the clerk comes to the words, “Charles Stuart to be a tyrant and a traitor,” at which he laughs. The charge accuses him of the whole civil war, and the death of thousands of the people, of division within and invasion from without, of waste of public treasure, spoliation and desolation of great parts of the country, and of continued commissions to rebels and disaffected persons. Charles demands by what lawful authority he is brought to this place, after a yet unconcluded treaty into which he had entered with both Houses of Parliament. Bradshaw replies that he might have observed that he is there by the authority of the people of England, whose elected king he is; and he retorts that England was never an elective kingdom, but an hereditary kingdom, for near these thousand years. He stands, he says, more for the liberty of his people than any here that come to be his pretended judges; upon which Bradshaw replies bitterly, “Sir, how well you have managed your trust is known. If you acknowledge not the authority of the court they must proceed.” Charles reasons that he has been brought there by force; that he sees there no House of Lords that may constitute a parliament, and that the king too must be in and part of a parliament. “If it does not satisfy you,” exclaims Bradshaw, “we are satisfied with our authority, which we have from God and the people.” The court is adjourned till the following Monday, the 22nd of January, and the guard is ordered to take the prisoner away. Upon which he ejaculates, “Well, sir,” and retires facing the court, and pointing to the sword says, “I do not fear that;” after which, amidst mixed cries of “God save the king!” and “Justice! Justice!” he is removed to Sir Robert Cotton’s house, and thence to St. James’, while the High Court adjourns to keep a fast at Whitehall. 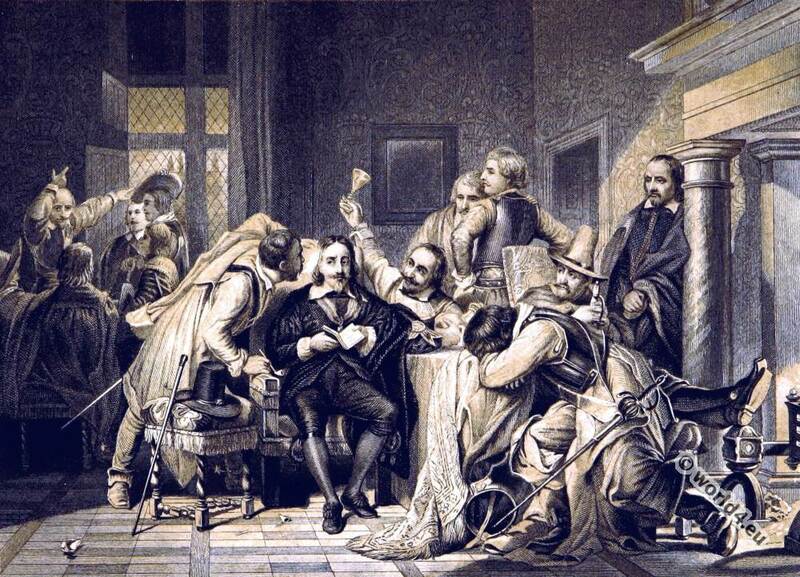 “Sir,” replies Bradshaw, “how great a friend you have been to the laws and liberties of the people let all England and the world judge.” It is Tuesday afternoon, and the sixty-three commissioners who have been in conference at the Painted Chamber adjourn to Westminster Hall, determined to give no further time to the king to plead, if he should still refuse. Coke asks for judgment, and Charles, on being called on for his defence, attempts to repeat the statements of yesterday. They will not hear him, and on his again refusing to acknowledge the authority of the court the clerk is ordered to record the default, and the king is again taken away by the guards. For two days, the 24th and 25th of January, the court has sat in the Painted Chamber hearing witnesses, and on the 26th the sentence is prepared. The morning of the last day of the trial dawns, and Bradshaw puts on a scarlet robe while the rest of the court are attired in their best habits. Again the king is brought in, “and there is in his manner a singular mildness. Amidst cries of Justice!” and “Execution!” from some of the rabble, one of the soldiers on guard says, “God bless you, sir,” and Charles thanks him; but the officer strikes the man with his cane. ” Methinks,” says the king, “that the punishment exceeds the offence.” He sees that there is little to be hoped for from this assembly, the solemn aspect of the court, the scarlet robe of the president, the manner of the soldiery. He urgently asks for a hearing, but is told that he must hear the court first. Bradshaw tells him that he has refused to answer the charge brought against him in the name of the people of England; and a woman’s voice cries out, “No, not half the people!” It is supposed to be Lady Fairfax, but the voice is silenced. Charles appeals to be heard in the Painted Chamber. John Downes, a citizen and one of the commissioners, desires that the court may adjourn. In some confusion the court adjourns, but returns in half an hour. Bradshaw cries out, “Sergeant-at-arms, send for your prisoner!” and Charles, who has been in solemn conference with Bishop Juxon, returns to the bar. Bradshaw refuses his request to be heard in the Painted Chamber, by the Lords and Commons, and in along and harsh speech seeks to justify the sentence. Charles hastily asks leave to say one word before that sentence is pronounced. He has heard himself called in the words of the charge, “tyrant, traitor, and murderer,” and at the last word has uttered a loud and startling “Hah!” and now Bradshaw says, “What sentence the law affirms to a traitor, a tyrant, a murderer, and a public enemy to the country, that sentence you are now to hear.” The sentence is that he shall “be put to death by severing his head from his body.” Bradshaw will not suffer him to answer a word; and saying, “I am not allowed to speak; expect what justice other people will have,” he turns away and goes out with his guard. These soldiers have little sympathy with him, though it is but two days before his execution, and he has had to submit to their insults added to his other misfortunes. Their outrages are borne with a serene patience, a lofty forbearance, and a fortitude which do not desert him, even during the sad parting which takes place on the last evening before his execution, when he bids his wife and children farewell—nor even at the block, when he takes the royal ornament from his neck, and hands it to Bishop Juxon with the solemn word ” Remember. 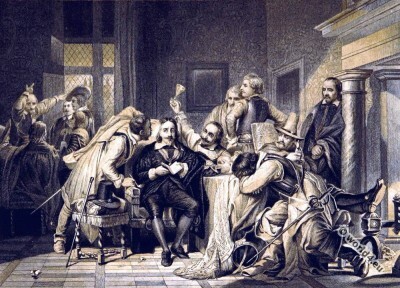 It is to the pages of Guizot’s History of the English Revolution that Delaroche went for the subject of the famous picture representing the insults to which Charles was subjected in the guard-room on the last day of his trial, the 27th of January, 1649, a scene which must have wrung the heart of the one spectator who was probably present, the faithful Herbert, who was the king’s constant and attached attendant, who attended the body to the grave, and to whom Charles gave his copy of Shakespeare,—the volume which is still preserved in the Queen’s library at Windsor. From the book: “Pictures and Royal Portraits illustrative of English and Scottish History. From the introduction of Christianity to the Present time.” Author: Thomas Archer. Published in London, 1878 by Blackie & Son.